Nubia X Dual Screen Smartphone to go Official on October 31 - Playfuldroid! Recent leaks have revealed that Nubia has been working on a smartphone with dual display. Previous leaks had claimed that the handset may go official as Nubia Z18s. However, the launch poster which confirms the unveil date of the phone as Oct. 31 also reveals that the handset will go official as Nubia X. 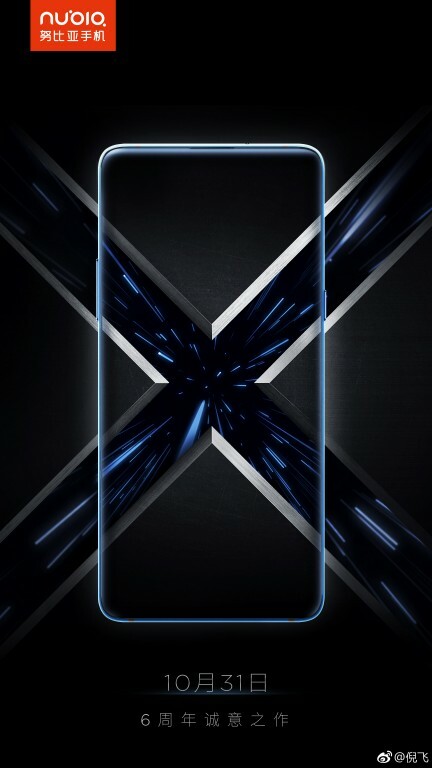 The above poster that has been shared Ni Fei, the CEO of Nubia has confirmed that the Nubia X will be debuting as the company’s 6th anniversary device. It goes without saying that the USP of the Nubia X is its dual display. According to TENAA listing of the phone, the handset will be featuring a 5.1-inch OLED screen that supports HD+ resolution on its rear and a frontal LCD display of 6.26 inches that produces Full HD+ resolution. The Snapdragon 845 chipset will be powering the Nubia X along with up to 8 GB of RAM. The handset will be coming with up to 128 GB of storage. It won’t be featuring a selfie camera. The back panel will be equipped with 24-megapixel + 16-megapixel dual camera setup. The rear display of the phone can serve as a viewfinder for capturing selfie shots through the rear cameras. The other features of the Nubia X are 3,800mAh battery, Android 8.1 Oreo and side-mounted fingerprint scanner.